Many employers are pulling away from snowmobile use in the field. The added safety of an enclosed and heated side by side removes many of the risks of working and traveling to remote locations in Alberta’s harsh winter climate. Adding tracks to a cabbed Ranger allows safe, comfortable travel for employees with the added benefit of the cargo box to carry in tools and supplies. The safety and convenience make the Ranger a far more desirable mode of work travel in the winter months. Adding tracks to the already versatile Polaris ranger makes it a valuable asset in limited access locations. The All season tracks allow the machine to gain traction in all conditions. The 570 EPS is equipped with power steering to compensate for the extra drag of the tracks allowing easy steering and full control of the UTV at all times. Outfitted with the same 4500lb winch as our other rangers, you can cross rugged terrain with confidence. The standard sports roof with an added full windshield and heated cab make this a comfortable reliable ride to remote access sites for workers and their equipment. 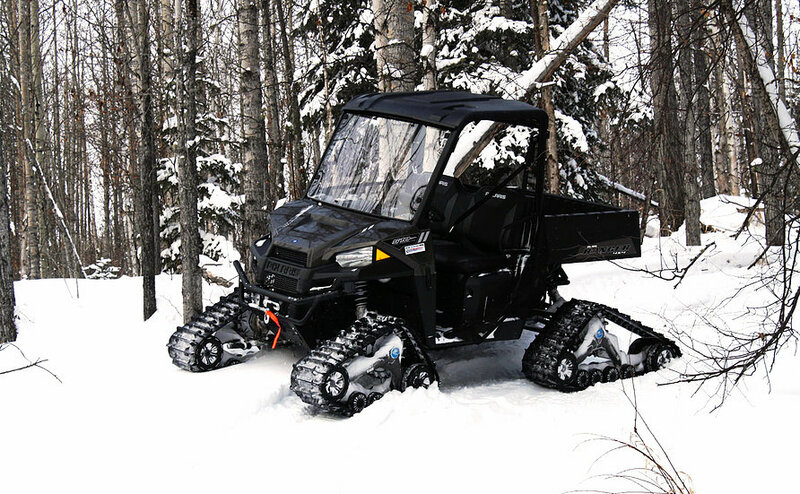 A tracked Ranger is a safer, more practical alternative to snowmobiles allowing the comfortable transport of employees as well as the tools and equipment needed on site.